William Tyler, perhaps best known for his work with Lambchop and Silver Jews, has been quietly ploughing his own furrow for the last decade. This has culminated in ‘Goes West,’ his forthcoming album and fifth release on Merge Records, which is described by his friend M. C. Taylor (AKA Hiss Golden Messenger) as the best music Tyler has ever made. For ‘Goes West’, Tyler has assembled a group of session stalwarts who weave in and out of his masterful acoustic guitar playing which forms the mechanical and artistic backbone of the album. The instrumentation is subtle and there is a lot of slow melodic growth and reflection on the record, rather than the sudden dramatic changes which can occur in purely instrumental albums. There are no cheap tricks to draw out a reaction; Tyler takes his time, and as a listener, it pays to take your time as well. These tracks are designed to wash over you like waves, and to speak to you subtly, with a whisper rather than a shout. One caveat would be that this album is not for everyone. This is often the case with solely instrumental albums anyway, and ‘Goes West’ is perhaps especially esoteric. It represents a singular artistic vision from a single artist, which he has pursued and realised. To quote M. C. Taylor again, it represents “a sort of narrowing of focus for William’s music; it sounds as though he found a way to point himself directly towards the rich and bittersweet emotional centre of his music without being distracted by side trips.” What this means in practice is that there isn’t something for everyone, either you’re on board or you aren’t. If you dig what he’s laying down, this album is a dream, but if you don’t, it could come across as inaccessible and even a bit dull. This is not necessarily a criticism, however. As an artist it is often the biggest challenge to make a record that holds true to your own creative vision, and this is something that Tyler has achieved with ‘Goes West.’ Whether it has mass appeal or not is no doubt a secondary concern for him. 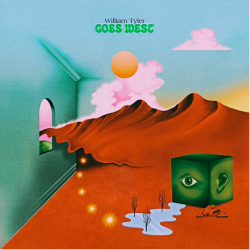 ‘Goes West’ is a well produced, richly textured, and interesting record – by turns expansive, yet deeply personal. There’s also a bravery to putting out an instrumental acoustic guitar album in an industry where three minute country pop reigns supreme, which shouldn’t be understated. In the end, whatever you think of the album, Tyler can stand by it with his artistic integrity fully intact. Refreshingly ambitious, this is a mellow and masterful guitar record.